Today we review "Lord Naga." Yes, "Lord Naga." Look at "Lord Naga" go! "Lord Naga" was created by Jack Kirby in 1976, but he sure wasn't called "Lord Naga" back then. He's still not - it's a title, so this would be like selling a toy of Superman and calling it "The Man of Steel" on the packaging. The character's real identity is Kobra, but Mattel couldn't really put a figure with that name in the toy aisles (for obvious reasons). As an infant, Lord Naga and his conjoined twin were taken from their parents by the Cobra Cult of India. The cultists separated the twins and raised Lord Naga to be a brilliant and vicious international terrorist, with hopes that he would lead them through the Kali Yuga - the time of great chaos. He may not have super powers, but with his devious intelligence and ability to manipulate thousands, Lord Naga is one of the most dangerous villains ever to exist. Now that's a carefully worded bio! See, there have been two different Kobras: first was Jeffrey Burr, then his brother Jason. Like the bio says, Kobra was one of a set of twins. His parents were told only one baby survived the separation surgery, and Jeffrey was taken away to raised by the cult. However, he and Jason had a Corsican Brothers thing going on, so the government recruited Jason as their secret weapon against Kobra. Kobra found a way to shut off the psychic link, however, and finally killed his brother. Years later Kobra died (killed by Atom Smasher and Black Adam) and the cult, needing a new commander, used its access to Lazarus Pits to resurrect Jason and install him as their leader. 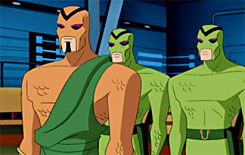 Kobra's original Kirby-designed costume was an orange, scaly, full-body suit, worn under a green toga. And that's an interesting fact, but it doesn't describe the outfit this figure is wearing. 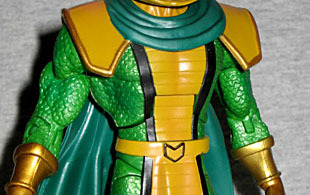 This is his more modern, more "costumey" design, which trades orange scales for green, and loses the toga in favor of a dark green cape, golden shoulder pads and a segmented stole with black trim. The sculpt seems to use the same base as Copperhead/Aquaman, but it's different enough that it's clearly been retooled. It's not just that his boots and gloves are new and that his snake-belly stole is sculpted on his chest, but the bands above his knees are molded on, and his groin isn't the same sculpt Copperhead had. The advantage of having your villain replaced by his own twin brother? One face works for both of them. If you look under his golden hood, you'll see an infuriatingly smug face staring back at you from behind a black domnio mask with blank white eyes. In the comics that usually appears to just be heavy shadow, but this is an acceptable interpretation. Kobra didn't really need any accessories, but he gets one. 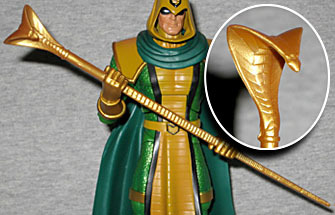 He comes with a 6⅜" long staff that has the ridged texture of a snake, a smooth section that is presumably a handgrip, then a stylized cobra headpiece. The figure has the usual DCU Classics articulaion - ankles, knees, thighs, hips, waist, wrists, elbows, biceps, shoulders, torso and neck - so he's poseable enough to hold the staff in both hands, if you so desire. It certainly looks cool that way! Oddly, Kobra was chosen to be packaged with the chest of the Series 19 build-a-figure, S.T.R.I.P.E. 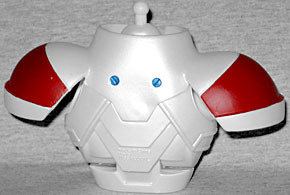 The chest is usually one of the largest, most expensive pieces, and so is generally included with a figure that was cheaper to produce. Many were expecting this would be the same sculpt as Stel's chest, but none of the parts are shared. This is also the most colorful piece of the BAF, added dark red and blue to the pearly white. Kobra (or "Lord Naga," if you have a large, well-funded legal team breathing down your neck) is a nice figure. The sculpt is more detailed than most DCU Classics, and he even has a superfluous accessory! How often can you say that these days? The Cult of Kobra is a wide-reaching threat in the DC Universe, having caused problems for the JSA, the Suicide Squad and many, many others. Want a villain capable of fighting any of your heroes? Kobra is it!